The 2015 Harrogate and district Volunteering Oscars winners. Picture: Adrian Murray. The winners of this year’s Harrogate and District Volunteering Oscars have been revealed. Winners were announced at a ceremony at Harrogate’s Old Swan Hotel on Friday. 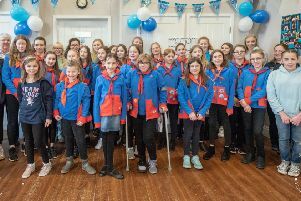 This year marked the ninth event and over the years over 2,500 volunteers from across the district have been recognised for the fantastic work they carry out. John Fox set up the Awards in his Mayoral Year 2008/9 in partnership with the Volunteer Centre at Harrogate and Ripon Centres for Voluntary Service and the Harrogate Advertiser Series. Another vital ingredient of the Volunteering Oscars is the generous support of the individual Award Partners. Pam Roberts and the PPR Residential Properties support the Care Volunteer Award, Harrogate Town AFC supports the Sports Volunteer of the Year and Yorkshire Business Market, organisers of the successful Harrogate Christmas market, supports the Corporate Engagement Award. Local company CNG is committed to working in the community and supports the New Volunteer Award and a new Partner for this year is Covance, who won the Corporate Engagement Award last year and are now committed to supporting the Volunteering Oscars.